Soarin’ Over California (film) Film attraction at Disney California Adventure; opened February 8, 2001. Guests are lifted up to 40 feet in the air, and surrounded by a giant projection dome. They then get a bird’s-eye view of much of the beauty and wonder of California, with an extraordinary sensation of free flight, accompanied by a musical score by Jerry Goldsmith. 4 min. Walt Disney Imagineering ride engineer Mark Sumner came up with the idea of the unique ride system one weekend by building a model with an erector set he had at home. 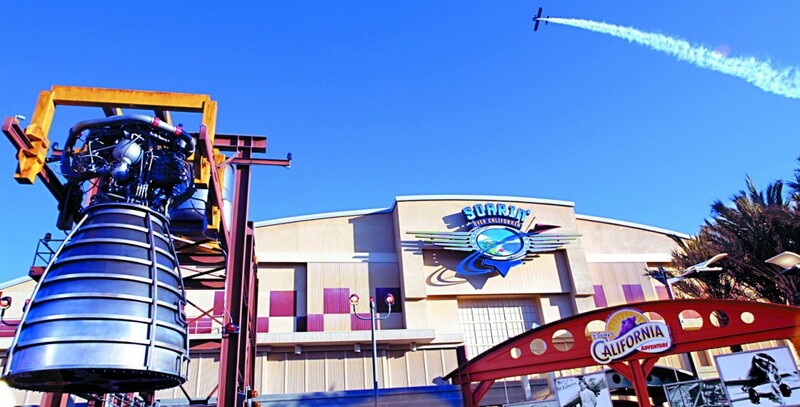 A similar attraction called Soarin’ opened as part of The Land at Epcot on May 5, 2005. On Jun. 17, 2016, the attractions became Soarin’ Around the World, taking guests above many of Earth’s natural and man-made wonders, including the Pyramids, the Matterhorn, Monument Valley, the Eiffel Tower, and Sydney Harbour. Another version, Soaring Over the Horizon, debuted in Adventure Isle at Shanghai Disneyland on Jun. 16, 2016. There, guests walk through an ancient observatory before experiencing an aerial tour of every continent, with special segments overlooking Shanghai and the Great Wall of China. In 2016, the attractions became Soarin’ Around the World, taking guests above many of Earth’s natural and man-made wonders. Another version, Soaring Over the Horizon, debuted in Adventure Isle at Shanghai Disneyland on June 16, 2016. There, guests walk through an ancient observatory before experiencing an aerial tour of every continent, with special segments overlooking Shanghai and the Great Wall of China.